The results of this election brings back some very painful memories for me. Imagine this: It is 2008, I am walking around Costco with my one-year-old. He is sitting in the cart while we were standing in line waiting for Papi to get “one last thing.” I am snuggling with him and speaking words of love to him in Spanish. “Dame un besito mi amor! (Give me a little kiss my love)!” He leans his head into me and kisses me in that sloppy way that little ones kiss. I ask him questions in Spanish asking him to point to his nose, his eyes, his head and he adorably complies. Just then, a man walks by with his two teenage daughters and says, rather loudly, “I’m tired of hearing all this Spanish stuff! If you’re in America you should speak English.” I stay silent because I am with my baby and concerned that if I confront him he will make a scene, yell at me and scare my son. Greg returns and immediately notices something is wrong. I tell him what happened and he jumps into rescue mode by approaching the guy and calling him out. He tells him that I have more education in my pinky than he probably does in his entire family tree. He asks him how many languages he speaks. He even calls the manager and tries to get his membership revoked. We walk out. The man goes his way and we go ours. That kind of interaction was all still very new and unfamiliar to my husband. It wasn’t, however, the first time something like that has happened to me. While this kind of ignorance is everywhere I knew that moving to Georgia would likely result in more in-your-face vitriol. I am always ready for those kinds of interactions. Being ready for a proverbial slap in the face, however, does not mean it will hurt any less. Here’s the thing that scares me though. Costco guy identified himself. He let me know exactly who he was and how much he hated people like me (or in his mind, I guess, loved HIS country). To be honest it is easier to deal with people like that because I know who they are and where they stand. The frightening thing, however, is the reality that I cannot possibly identify who does or does not support those “immigration policies.” The people that scare me are not the Costco guys. They ones that truly scare me are the really nice people who would, with all sincerity, tell me, “He’s not talking about people like you Marisela. He’s talking about illegals. He’s talking about criminals.” These nice people don’t know my history. They don’t know my status. They don’t know my family. They don’t know my community. They see a college-educated, upper-middle-class, light-skinned Latina who drives a BMW and is married to a White guy. Therefore, I am not “one of those people.” What these nice people don’t understand is that I am those people and those people are me. I don’t know if that red represents love for Trump or hate for Hillary but, honestly, both scare me. I went to the movies this weekend and noticed that the Nina Simone biopic was released. Nina Simone. Her name makes me feel several emotions at once…emotions for which words haven’t even been invented yet. Her music has cradled me through some very dark times. Her voices wraps around me like a warm blanket that helps the day melt away. Right now, I’m listening to A Single Woman and remembering sitting on a hilltop in Johannesburg, South Africa feeling lonely…yet invincible. So how on Earth did a Chicanita from Battle Creek, Michigan get introduced to Nina Simone? Simple…Elsa Barkley Brown, an amazing historian, scholar, and role model. I took a course with Dr. Barkley Brown called Black Women in America. One day she brought in a record player and told us a story of the first time she saw Nina Simone in concert. The energy in the room changed immediately. Dr. Barkley Brown’s face lit up as she shared about how she braved a winter storm just to watch Nina in concert. Despite the bad weather, Miss Simone refused to cancel the concert and gave her small, intimate audience a show for thousands. The song she played in the background as she spoke with us? Mississippi God*amn. From then on, I was hooked. I ran to the CD store (yes a CD store) and bought the only CD I could afford. I worked in a library at the time and convinced them to buy more of her CDs so I could listen to more. I gulped her music like dry ground drinks rain. Four Women. Black is the Color of my True Love’s Hair. I put a Spell on You. Plain Gold Ring. Her voice is hypnotic, relatable, and painfully beautiful. She sings like she is exhausted but simply cannot help herself because she has to sing. I needed to hear her at the time because The University of Michigan was under scrutiny for its affirmative action policies. When I would tell white people where I went to school many would say, “Oh of course! You’re Hispanic!” One time, during a college visit, I was on a panel and a father stood up in the background and said, “How does it feel knowing that you took my daughter’s spot?” He was white. Now, I am not someone who knows exactly what to say in the moment. I’m that person who thinks of something cool to say fifteen minutes later. That day, however, the right thing came out of my mouth. The room was super quiet and I said, “Sir, I’m sorry your daughter didn’t get into Michigan. I can assure you, however, that I deserve to be here.” I began to spout off my qualifications and he seemed to relax a little. I said, “I hope that makes you feel a little better…but I have to ask you a question. Who told you that was her spot? Who said it was yours?” I doubt I made him get pensive about privilege, but I made my point. Later, I relayed the story to Dr. Barkley Brown and shared about how insecure I felt despite my momentary surge of confidence. I likely did get “points” when I applied. Did that mean I needed them in order to get in? She gave me the best advice ever! She said, “Marisela, you need to stop walking around here like Michigan did you a favor by accepting you. You did Michigan a favor! Where else were you accepted?” I told her. “See! You could have gone anywhere! You chose Michigan and Michigan is better for it. Michigan needs students like you with experiences like yours. You make this campus better. You are opening the door for your sisters.” From that day on, I walked around campus like I owned the joint. Young, Gifted, and Black played in my head that day…with a slight change in the lyric perhaps. I really dig Zoe Saldana. She’s an amazing actress. I loved her in Avatar, Guardians, and my personal favorite, Columbiana. [I love it at the end when she says, “Eat!” and the dogs devour the bad guy. What can I say? I have a sick sense of humor]. Then I saw the leaked photos and my heart stopped. I thought, “Ay mija…no..por favor…no! Don’t let them do that to you!” I kept clicking on photos hoping that at least one wouldn’t look so terrible. That maybe…just maybe she did look like Nina and it wouldn’t be so bad. But I have yet to find one. Frankly even if I did…I know I wouldn’t like it. There is a part of me that desperately wanted to support my fellow Latina. But the part of me that knows and understand the history of race in America and, specifically, the practice of blackface, simply cannot. Yes, she is Afro-Latinx. Yes…she is incredibly talented. But as Eduardo Bonilla-Silva (EBS) often urges: we in Latinx communities have to come to terms with our own troubled notions of race. As Latinos, we don’t call it racism though. We give it cute, racism-lite terms like colorism. It’s colorism…not racism. No, mi familia, it’s straight up racism. 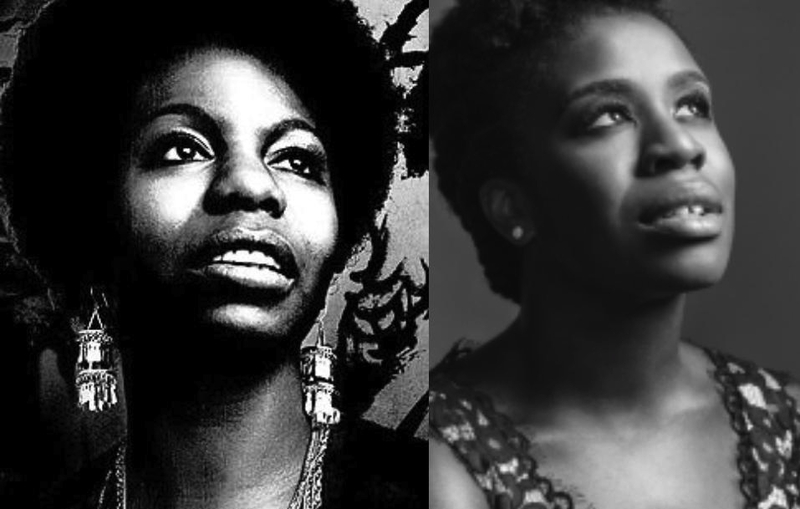 I was never more convinced about my feelings as when I saw a meme of Uzo Aduba and Nina Simone side-by-side. I cannot find the original Facebook post, but here is an excellent comparison. Also, there are numerous compelling articles that discuss the bevy of other Black actresses who could have played Nina Simone. I will not revisit those excellent options either. What I will say, however, is that as a Chicana I have come to recognize when and how White Hollywood pits Black and Brown against one another. This is one of those instances. I value Zoe Saldana and love it when a Latina is on the big screen. But it cannot be at the expense of my Black brothers and sisters. Nina Simone provided a movement with music. Her songs about race and inequality are about blackness in America. Yet…it is also a gift to those of us who also feel marginalized, excluded, forgotten, and ignored. We need to cherish her gift not cheaply imitate it. She and her legacy deserve better. So, as much as I love supporting Zoe, I will not watch the biopic. Instead, I watched What Happened Miss Simone? on Netflix and fell even more in love with the troubled artist. To find out that she struggled with mental illness was so incredibly liberating. I finally understand why Little Girl Blue still makes me cry to this day.